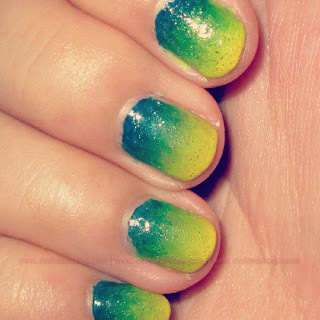 Nails of the day with Elianto nail polish in Yellow, Lime Green and Novy, and Wish glitter top coat. I used a porous sponge in creating the gradient, which explains why the design has a gritty look to it. I found out that when you use makeup sponges or any not-so-porous ones, the gradient would look smoother. I was actually in the middle of organizing my nail polishes when I came up with this color scheme. I saw my Elianto polishes and thought that they'd go well together. I usually put the darker color on the tips of my nails but this time I decided to switch things up a bit. Para maiba naman! I did a similar post on my blog, but only used 2 colors. I'll definitely be trying this in future, they look awesome!! OMGGG Wish I knew how to do this on my own!! :) Really love your nails!! ♥ Catch up again soon, Aya! I love the combination of colors, it's refreshing! btw, did you see the link I sent you on youtube? Super like! Aya, ako din lagyan mo ng nail polish :D di ko pa din alam kung kelan ko gagamitin yung China Glaze dito. Huhuhu! I like it! Parang under the sea. Yey! Yep, bubbles, I think. The sponge I used was very porous (ran out of nail art sponges and cosmetic wedges). what a cute design!!! I really like it. I can't do my nails that good. I'll probably have a difficult time doing this. It's easy to do, too :D Hope you try it! I love your bog! I love nail polish and I'm learning a lot :) I followed you :) Would love it if you could visit my blog too and maybe get a follow back? :) Thank you and more power! Thank you dear! Sponging is easier than actually painting your nails with a brush so kering keri sa non-dominant hand :D Hope you try it!